The 5.7 inch colored touch screen is used as operating monitor as well as for displaying all measured values. You can even move the unit in all directions by simply touching the screen. All commands can be done via touch screen. Cornea Thickness Related IOP You can easily adjust the measured IOP data according to the central corneal thickness. 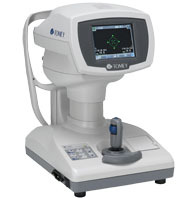 The calculation formula used by the FT-1000 is individually adjustable to your own preference. The handling of the FT-1000 is very easy - it does almost everything by itself. Alignment and measurement are done automatically. You just roughl align the system towards the patient eye and the rest is taken care of by the instrument. With a tip on the screen the system automatically moves to the left or ight eye. Call for shipping quote.